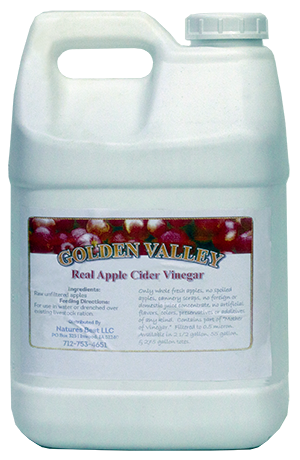 People have known for thousands of years that this kind of raw, pure, whole-apple, naturally-fermented vinegar can be used as one of the best natural elixirs for healing and restoration of health for sick or injured animals, but new field trial studies show that when ACV is given to healthy animals it serves as an excellent immune tonic, a powerful restorer of ideal digestive (and rumen) function and functions as a preventive against many parasites and diseases. Only in the past ten years or have we discovered what is an even more amazing property of ACV which is the power to enhance the cellulosic bacteria in the gut to convert more crude fiber (cellulose and hemicellulose) into desirable sugars. Sugar (energy) contributes greatly to putting on extra marbling (intramuscular fat), adds more butterfat to the milk and enhances average daily weight gains. ACV can easily be applied to forages, hay or silage, it can be added to the water supply or one can simply offer it free choice. This is the only known nutritive substance that you might say actually "pays you to give it”.